I left my helmet in the car today. You always here about how athletes have their "superstitious" routines. As time goes on I am becoming more aware of the value of routine. The more I can get a routine going the less likely I am to do something like leave my helmet behind. We noticed that the rear chain rings were loose and I got off my routine. The was all stressed out that I was going to need to buy a new set of gears and chain and .... I was so happy when Juan took out a tool and was able to tighten up the sprockets! Oh yeah, and not only did getting out of the routine make me forget the helmet but I also forgot to reset the computer. So the numbers are an accumulative from last Friday except for the Dst/D (distance for the day). 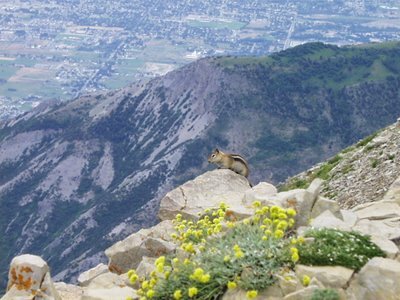 Today's picture comes from a hike to the top of Timp a few years ago. This squirrel was running around in the saddle as you come from the back side of Timp to the front side. I was thought it would be great if I could get him to go out on that rock so I could get a picture of him over the valley. While I was trying to figure out how I would put a peanut out on the rock to lure him out there, he took mercy on me and went and posed for me, making it so that I didn't have to risk my life to get the picture. At that point the angle was not quite what I wanted but I hurried and snapped the picture while I had the chance. Again click on the image to see the full size version.